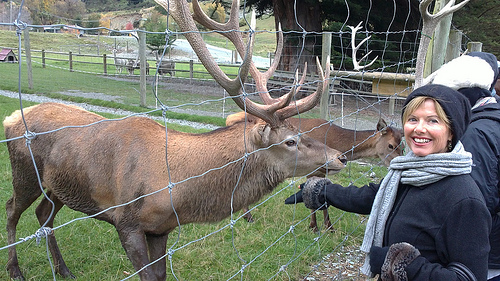 Today, we did the Walter Peak High Country Farm Tour from Queenstown. 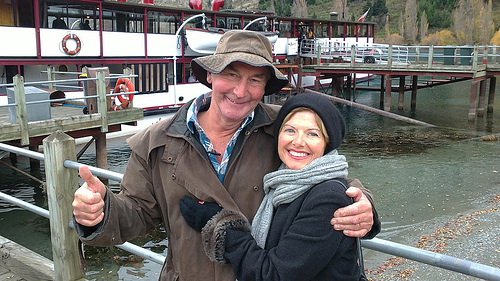 It began with a boat ride to Walter Peak station on the TSS Earnslaw. 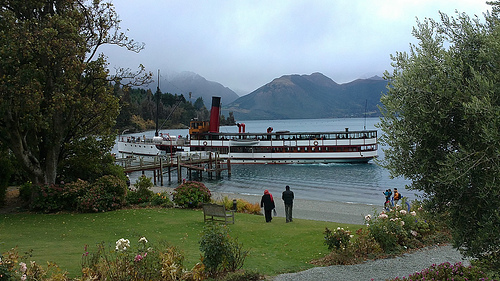 No trip to Queenstown is complete without a ride on this beautifully restored steamboat. There’s such a festive atmosphere on board as you’re gently serenaded by a pianist. There’s no need to go hungry either. Wholesome snacks are drinks are served for the peckish. 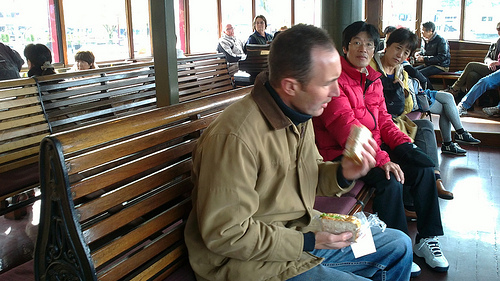 I suspect these two onlookers have placed bets on how quickly Michael can eat an egg sandwich? The TSS Earnslaw has a great area in which to view the engine room. There’s also an area displaying historical photos photos of locals from a bygone era. 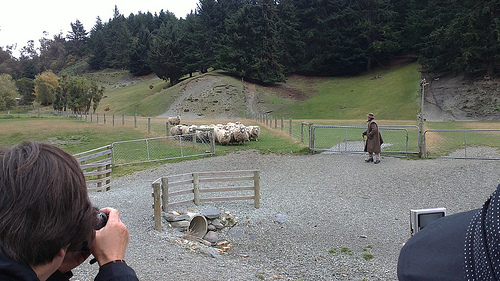 Visitors disembark at he Walter Peak Station wharf and that’s where our Rural Host and his dog were there to welcome us. Today, our Rural Host was a great entertainer and provided plenty of laughs. Lindsay actually had some of us believing that the spots on baby deers (bambi) can be bought. He’s looks every inch the High Country farmer complete with oilskin hat and coat. 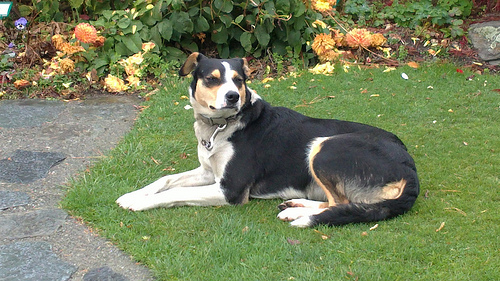 The walking tour of the farmyard includes a sheep round-up by dog, Bess. Lindsay bellowed a greeting to the animals who raced towards – Romney-Cross & Merino Sheep, very hairy Scottish Highlander cattle, Llamas etc. For me, this magnificent Stag was my favourite. He’s currently looking for a female and I hope he finds her. Everyone gets a chance to feed the animals and its nice a nice experience to have such a personalised interaction with them. Although Lindsay’s provided a lot of interesting information, it was hard for some of the visitors to separate fact from fiction. Lindsay loves to have fun with ya! 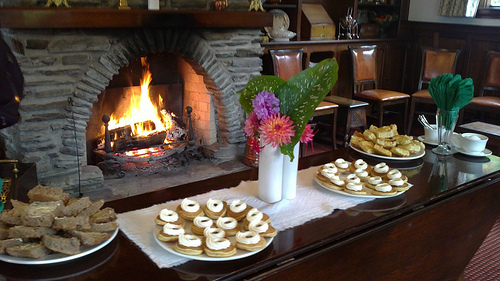 Another highlight was being invited into the station’s old homestead for refreshments. We swooned over the cheese & onion scones, cinnamon buns and scones with jam and cream. We loved being warmed by the crackling fire. Bess, the working sheepdog got her chance to show a few skills. Watching this intelligent animal in action was pure poetry. With just one command from Lindsay, she leaped over the fence and disappeared up a hill for a while. Suddenly we heard the sound of many hooves and Bess appeared herding a flock of sheep towards us. It only took a subtle change in body language from Lindsay and Bess completed a successful roundup into the pen. 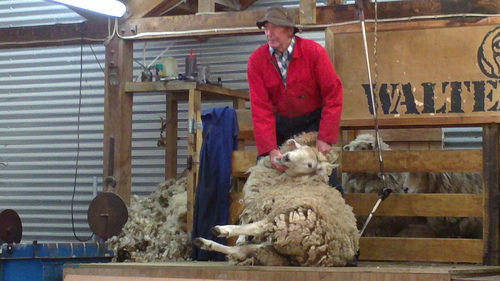 Next up was sheep shearing. Lindsay changed into overalls then politely asked a large Romney sheep to come through to be shorn. Lindsay was ignored so he pulled her out and the demonstration began. The process was surprisingly quick and yielded a magnificent pelt. The bidding began with Lindsay holding up a bit of sheep poo. “Let’s start the bidding at four dollars” he yelled. He pointed to an unsuspecting woman in the front row and made a great show of accepting her non-existent bid. The woman’s family thought it was hilarious. This’ll be a good one for the dinner party back home! 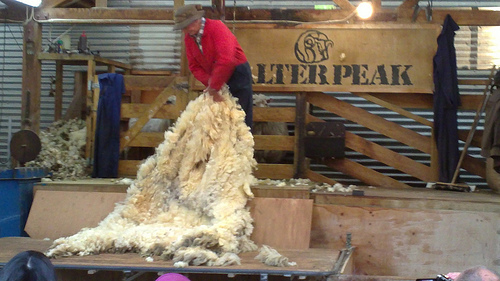 After the shearing we got to wool being spun in the shop next door. 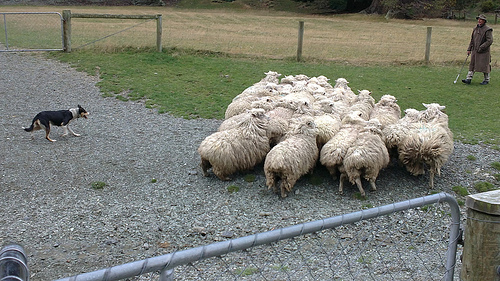 I thought the prices for the wool products for sale were very reasonable. 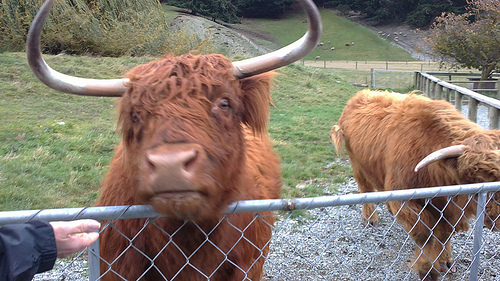 The Walter Peak High Country Farm Tour from Queenstown is for everyone and great family entertainment. We’ll let Bess have the last word.